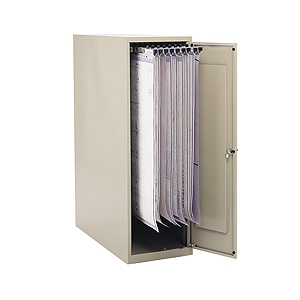 The Safco Small Vertical Storage Cabinet Model 5040 is a heavy-duty steel enclosed blueprint cabinet that will hold up to 1200 documents (100 drawings per clamp recommended maximum) using twelve 18" or 24" (all same size or mixed) hanging drawing clamps. Please note that hanging clamps are sold separately. 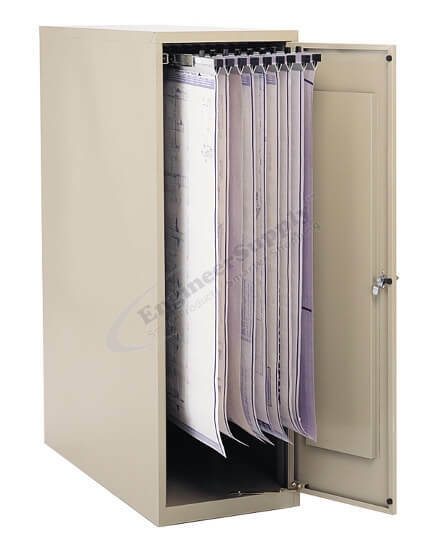 Easy access to stored documents with the suspended track that smoothly slides in and out of the cabinet on steel ball-bearing rollers. Piano-hinged steel reinforced door can be mounted on left or right hand side and comes with key locked handle. Blueprint cabinet is painted tropic sand in color using heavy-duty paint. Cabinet is shipped set-up with no assembly required. 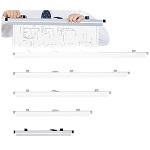 Cabinet will hold up to 24" size hanging clamps maximum.